Apr 11, 2019 News!Vol. 9, No. 4 has been indexed by Crossref. 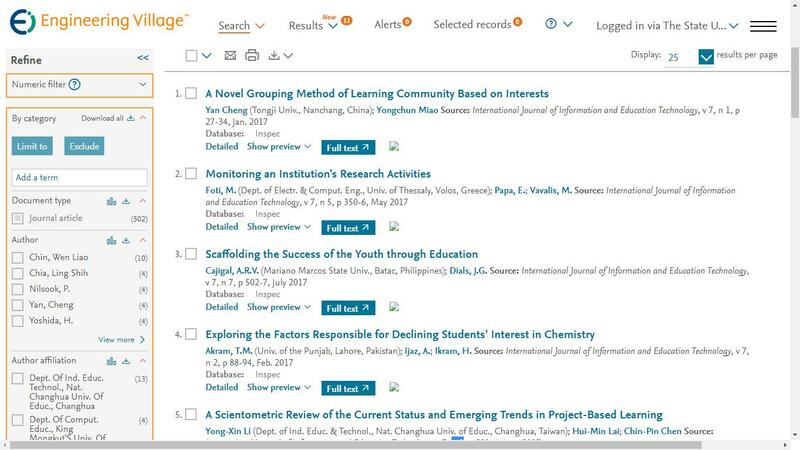 Abstracting/ Indexing: Scopus (Since 2019), EI(INSPEC, IET), Electronic Journals Library, Google Scholar, Crossref, etc. It is my honor to be the editor-in-chief of IJIET. The journal publishes good-quality papers which focous on the advanced researches in the field of information and education technology. Hopefully, IJIET will become a recognized journal among the scholars in the related fields. Abstract—This study reviews research methods commonly adopted in scholarly literature on students’ and instructors’ experiences of using Massive Open Online Courses (MOOCs), published from January 2014 to April 2016. 53 articles were identified through a search of four electronic databases. The findings show that surveys, interviews, and log files extracted from MOOC platforms were the most frequently adopted methods for data collection. The use of other qualitative research methods such as diary studies and focus groups was less common. The majority of identified articles adopt a single research method. Methodological triangulation is observed in studies which collect data from multiple sources. For studies which adopted methodological triangulation, it is observed that surveys are often triangulated with interviews and log files. The ways in which MOOC scholars use the key research methods are discussed, and future research avenues based on the research results are provided. Index Terms—MOOC, research method, student, review, online course. R. Deng and P. Benckendorff are with UQ Business School, the University of Queensland, 39 Blair Dr, St Lucia, Queensland, Australia (e-mail: r.deng@uq.edu.au, p.benckendorff@uq.edu.au). Cite: Ruiqi Deng and Pierre Benckendorff, "A Contemporary Review of Research Methods Adopted to Understand Students’ and Instructors’ Use of Massive Open Online Courses (MOOCs)," International Journal of Information and Education Technology vol. 7, no. 8, pp. 601-607, 2017. Copyright © 2008-2019. International Journal of Information and Education Technology. All rights reserved.